The Super-Wealthy or the Rising Poor: Which Is the Better Bet? A hedge fund manager who made a billion dollars betting on the collapse of oil has found his next short. At the other end of the spectrum, ordinary investors should look at this long idea. U.S. stocks are higher in early afternoon trading on Wednesday, with the S&P 500 (SNPINDEX:^GSPC) and the Dow Jones Industrial Average (DJINDICES:^DJI) (DJINDICES: $INDU) up 0.26% and 0.30%, respectively, at 11:40 a.m. ET. But it's the emerging markets that are in focus today: Following five straight days of losses, the iShares MSCI Emerging Markets ETF is up 0.37%. Today's tale starts a "big picture" macro bet, but stay with me as we follow it to a straightforward investment idea for ordinary investors. Not content with the billion dollars he earned on his 2014 bet that the price of oil would collapse, hedge fund manager Zach Schreiber has been pondering the implications of that collapse. Naturally, that has led him back to the source of much of the world's oil and a trade he believes could return 10 to 50 times his money. Speaking at the Sohn Investment Conference in New York yesterday, Schreiber is effectively shorting the world's second largest oil producer, Saudi Arabia, with a bet against its currency. The value of the Saudi Riyal has been fixed at 3.75 for dollar since 1986. Schreiber says that so-called fixed peg is "massively overvalued," and he believes Saudi Arabia will soon be forced to repeg the currency so that it takes more riyals to buy a dollar. He estimates that with oil at $50 per barrel, Saudi Arabia will spend some $80 billion to $100 billion of its foreign-exchange reserves per year to fund -- among other things -- the expansive social programs that keep the kingdom's subjects happy. With a GDP-per-capita of $52,010 in 2014, Saudi Arabia is one of the world's wealthiest nations -- it is 12th in the World Bank's ranking, two spots behind the United States. But I would have to agree with Schneider: I don't think Saudi Arabia is a great bet (whether it be in the medium or the long term). But past underperformance sows the seeds of future outperformance, and at some point, the valuation gap between the MSCI Emerging Markets becomes difficult to ignore. 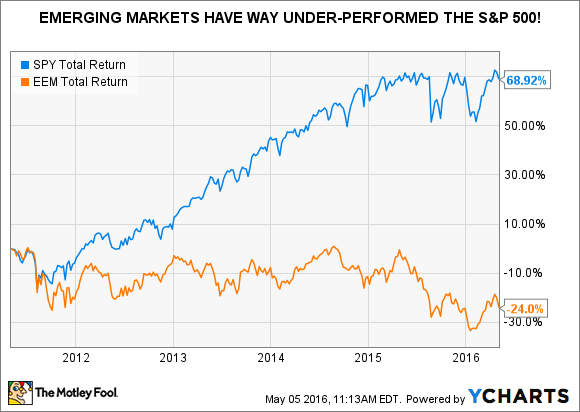 The brainiacs at investment management firm Research Affiliates estimate that the MSCI Emerging Markets Index will earn an annualized real return of 8.1% over the next 10 years against just 1.3% for the S&P 500 (admittedly, their confidence intervals around the MSCI Emerging Markets' expected return is significantly wider). Over half of the differential between the two stems is attributable to an expected upward revaluation of emerging markets and a downward revaluation of the S&P 500.